When I was preparing to welcome my first child home, like most women do, I spent a lot of time thinking about 3 things: the baby registry, the nursery, and the birth. Fast forward to baby's arrival: the birth came and went in the blink of an eye, I couldn't care less about the color theme in baby's nursery at 2am in the morning, and our tiny condo was overflowing with baby gear from our registry and no where to put it all. I think the baby industry does a huge disservice to moms-to-be by focusing all their attention on the nursery "must haves" and infamous birth plan. Looking back, when I was a mom-to-be I sincerely wish I would have allotted more brain space to considering some of the topics below. In fact, I would trade every minute if thinking about my birth plan for thinking about the coming months/years, had I known what to be considering. So - below is a list of things to consider. THIS IS NOT A TO-DO LIST! This is just my list of things I encourage new moms to simply think ahead about before baby comes. If you read the whole list and then do nothing, great! But if it saves you some time down the road by thinking about some of these things now, even better! where will the main play area be as baby grows into a toddler, and do you have room for toys and activities in that space? what about in baby's room as baby grows into a toddler? Is there room in baby's closet or dresser for bigger clothes as baby grows? Is there space for the baby gear or do we need to temporarily remove some furniture? Is there room in the kitchen for baby's bottles, baby food making supplies (if you go that route), and eventually your toddler's dishes and sippy cups? Is there room in/near the bedroom for diaper storage? Diapers come in big boxes and you'll want somewhere to store the big box of diapers as you likely will only be putting a few dozen at a time into a draw or diaper bin. If you're using cloth diapers, you'll need to devote even more storage space for the related supplies (we use the entire top drawer of their dresser, which also doubles as their changing table). *A note on toys: I'm not talking about frivolous, unnecessary toys. I'm talking about educational, necessary toys/activities/learning tools such as: rattles, books, blocks, music toys, art supplies, make believe play (kitchen/tool shop/house/dress up clothes), legos, matchbox cars, outdoor toys, puzzles (oh the puzzles! ), etc. I recommend storing half of the toys/activities out of sight at all times (up high in a closest, for example) and rotating your child's toys every month or so. This cuts down on the actual amount of toys you "need", because your child feels like the toys brought down from storage are brand-new every time! All the baby gear you'll be assembling soon: Where will all of that gear be stored when baby outgrows it? Baby's clothes: Most people store clothes simply by size and I've found that to be the easiest too. Everything of a certain size goes into one bin, including coats, swim wear, etc. Storage bins take up a lot of space, though! 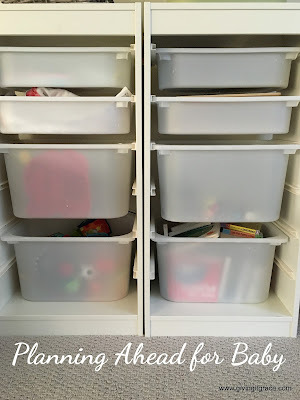 You'll want to think about where in the house you can make space a 1-2 dozen storage bins (each time your child moves up a size, you'll add a new bin to the collection). Baby toys: Where will you store the toys as your baby outgrows them? 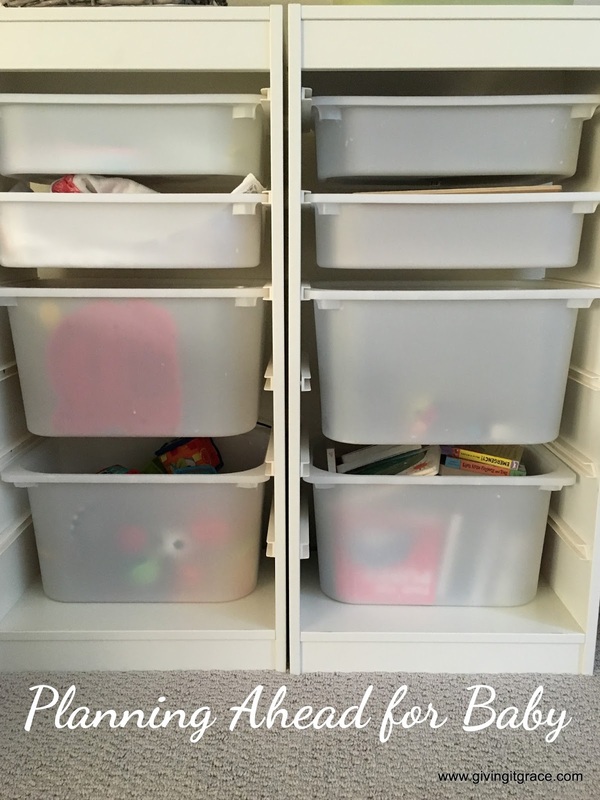 We do storage tubs of toys sorted by age (baby, pretoddler, toddler, etc). Do you have enough space for all those photos on your phone? Computer? Do you regularly back up your photos to your iCloud or computer? How do you want to start preserving your family photos so they don't live forever on your hard drive? How are you going to share photos of baby with family and friends? Some families choose to print off photos every month/year and just store in a photo storage box, while others choose to create online photo albums. A few of my favorite sites for doing online photo albums are Shutterfly, Snapfish, and MyPublisher. Some new moms love to share photos via Facebook for all the see, while others want something a little more private (like a blog!). If most of your family members have iPhones, I recommend setting up a Photo Stream for your family and invite other family members to join the Photo Stream. Friends and family - who in your circle already has kids? Who has a home life that looks like something you want for your family? If you're breastfeeding, it's best to research your local breastfeeding support options now. Our hospital offered a drop-in breastfeeding support group led by some of the Lactation Consultant's on staff. I went faithfully for weeks with Drew, simply because I felt safe there and I was surrounded by other moms trying to get the hang of the whole mothering a newborn thing. The Le Leche League is also a knowledgeable resource, although they are typically not Babywise friendly so keep that in mind. Do you want to invest money into transition clothes, or just purchase a few things to tide you over? Facebook groups: Both of the groups I am in (this one and this one) are full of supportive women who really take the time to help you navigate getting your baby the best sleep possible. I hope this list has given you some things to ponder now before baby arrives and you begin your adventure in parenting. If you're a seasoned mama reading this list, anything you would add?